Mount Eva stands on the Continental Divide to the south of James Peak, Mount Bancroft, and Parry Peak. This 13er looks intimidating when viewed from the Fall River Road. The eastern ramparts of this peak have windswept gullies that drop precipitously to the Fall River Reservoir. Hiding behind these crags is the broad Southeast Face and Eva Bowl. This area is highly accessible, but under-skied compared to other Front Range Peaks. The basin on the south side of the mountain hosts several low angled bowls and Eva is often combined with a route on its neighbor Witter Peak. The Eva Bowl, Southeast Face, and South Couloir share a common approach to the basin below Mount Eva at 12,000’. From the point you parked on the Rainbow Road, hike up the bumpy road to the intersection with Chinns Lake Road. This is seven tenths of a mile from the road’s intersection with the Continental Divide Trail. There are two options here. The first is to continue on the Rainbow Road one mile to the Fall River Reservoir. Locate the creek on the southeast shore of the reservoir and follow this uphill several hundred feet to Chinns Lake. The other option is to take the Chinns Lake road one mile directly to the lake. If this road is snow covered you will be travelling over angled snow slopes that will make your left hip and knee feel shorter than your right by the time you reach the lake. From Chinns Lake, make your way through the forest to Slater Lake and then continue up and across a flat basin to 12,000’ (1.35 miles). On the hill to the hiker’s left of Slate Lake is a large boulder framed with a wind barrier as a memorial to RJB that can offer shelter if it is a windy day. The Eva Bowl is a great place for aspiring adventurers that are new to the activity of ski mountaineering. It does not take long to get in here, has a mellow approach, and the skiing is easy to moderate. 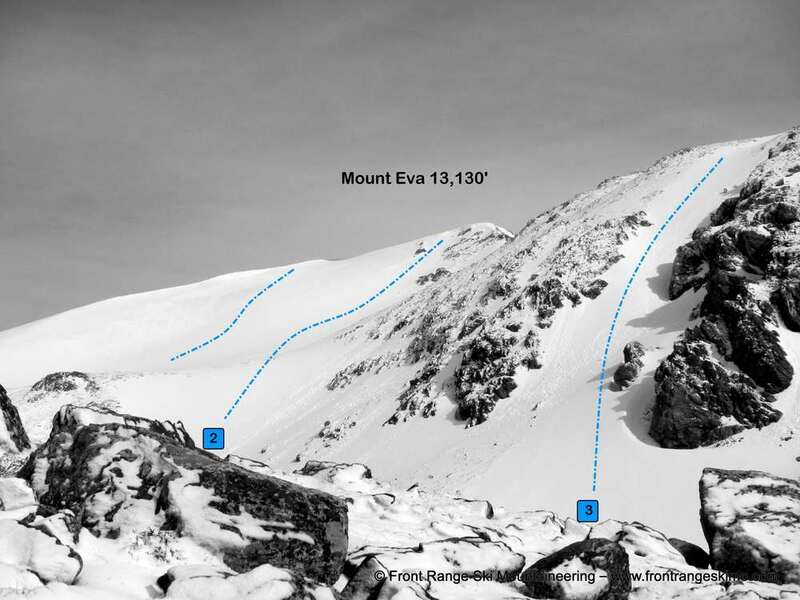 The bowl between Mount Eva and Point 12,805’ is wide and has numerous lines to choose from. You can easily do multiple laps in this area. The middle portion of the bowl at approximately 12,250’ is often windswept all winter and the snow can be very shallow here in the spring. Keep your head up for shallow and extruding rocks in this area. Follow the shared approach to 12,000’, look up, pick your line, and keep climbing. The Southeast Face is the best line on Eva. The initial turns directly below the summit can be quite spicy with cornices, a steep headwall, and rocky terrain to navigate. The line moderates quickly and by staying skiers left you can avoid the windswept rocks in the bowl at 12,250’. If you stick to the left side of the basin you may be able to stay on snowfields all the way to Slater Lake. There is a small saddle southwest of the summit where you can drop in sans cornice. There are also the remains of telecomm equipment below the summit and this can be a good place to hide from the wind while the snow defrosts. Follow the shared approach to 12,000’ and then continue west up the basin aiming for the saddle between point 12,850’ and Mount Eva. At this saddle you can work your way up the south ridge to the summit. You pass this fickle couloir on the way to the Eva Bowl and Southeast Face. This chute has a short window of time to be skiable on smooth corn snow. If there is fresh snow in the spring it gets exposed to loose wet slides and it frequently has slide debris in the gut of the chute. Follow the shared approach to 12,000’ and then turn directly north and climb the couloir. The fan below the couloir is often thin and rocky. The closer you are to the cliffs on the right, the more likely you are on deeper snow. The northeast aspect of Eva drops from the terminus of the East Ridge at 12,850’. The winds of winter are relentless in this area and the emphemeral lines that form on this face result from a big upslope storm. Just around the corner from this face is a strip of snow that is deposited due to a rock barrier creating a leeward effect. This is Eva’s strip of snow and in a good year you can ski this from just below point 12,850’ to 11,600’ in the Fall River Basin. As you ski this, revel in the fact that this is possibly the only piece of snow that the wind does not strip away from this basin. From the Fall River Reservoir described in the shared approach, cross the reservoir if frozen or traverse the south shore to the west side. Switchback up the forested headwall looker’s right of the lake to a flatter area at 11,250’. Continue up the valley generally staying on the right side of Fall River and work your way around the Northeast Face a half mile into the higher basin below Eva’s Strip o’ Snow. There are three possible trailhead points on the Rainbow Road depending on the snow conditions and private land. This road is located 6.6 miles from the Fall River Road exit 238 on Interstate 70. Follow the Fall River Road 6.6 miles to the major switchback. Exit the paved road and go straight on the dirt Rainbow Road. The majority of this road is in private land. Please respect this private land and do not park on the edges of the road that borders this property. The best options for parking are at the Rainbow Road and Fall River Road junction, at the first switchback, at the intersection with the Continental Divide Trail (10,225’) and at the Fall River Reservoir (10,500’). The snow and your tolerance for rock crawling will dictate where you park. In the late spring you can usually get a high clearance four wheel drive to the intersection with the Continental Divide Trail.